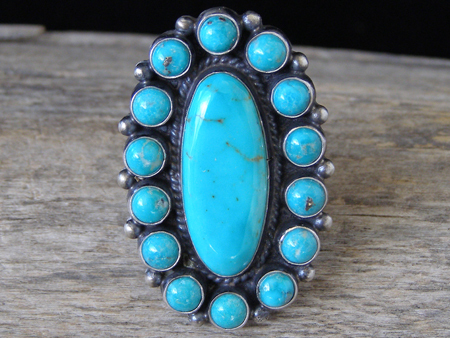 This classic cluster ring has a large center oval of stabilized Kingman turquoise at its center surrounded by fourteen matching rounds. Because this turquoise is stabilized, it will not change color over time (unlike natural, untreated turquoise) and it has been hardened, which makes it more resistant to fracturing. The shank of the ring is formed by a length of low-dome wire which is split into three narrower bands before attaching to the ring back.